My father gave me this book as a gift for my birthday maybe 5 years ago and now I even reference it in my class when we get to talk about more recent conflicts. It is well written and it offers a lot of information so that the reader can have a better understanding of the subject. Chester A. Crocker Fen Olser Hampson - Chester Arthur Crocker (born October 29, 1941) is the James R. Schlesinger professor of strategic studies at Georgetown University’s Walsh School of Foreign Service and serves on the board of its Institute for the Study of Diplomacy. Dr. Crocker’s teaching and research focus on international security and conflict management. From 1981 to 1989, Dr. Crocker served as Assistant Secretary of State for African Affairs. He developed the strategy and led the diplomacy that produced the treaties signed by Angola, Cuba, and South Africa in New York in December 1988. These agreements resulted in Namibia’s independence (March 1990) and the withdrawal of foreign forces from Namibia and Angola. President Ronald Reagan granted him the President’s Citizens Medal, the country’s second highest civilian award. Dr. Crocker chaired the board of the United States Institute of Peace (1992-2004) and continued to serve as a director of this independent, nonpartisan institution through 2011. He serves on the boards of Universal Corporation, Inc a leading independent trading company in leaf tobacco and agricultural products; and the Good Governance Group Ltd, a strategic advisory consultancy service. He is a member of the World Bank’s Independent Advisory Board on governance and anti-corruption; is a founding member of the Global Leadership Foundation, a leading international NGO that advises leaders facing governance and conflict challenges; and also serves on the international advisory board of International Affairs (London). Dr. Crocker consults as advisor on strategy and negotiation to a number of U.S. and European firms. Dr. Crocker’s previous professional experience includes service as news editor of Africa Report magazine (1968-69) and staff officer at the National Security Council (1970-72) where he worked on Middle East, Indian Ocean, and African issues. He first joined Georgetown University as director of its Master of Science in Foreign Service program, serving concurrently as associate professor of international relations (1972-80). He served as director of African studies at the Center for Strategic and International Studies (1976-80). Dr. Crocker lectures and writes on international politics, U.S. foreign policy, conflict management and security issues, and African affairs. He has appeared on numerous television shows, as a dinner or keynote speaker at conferences in the U.S Europe and Africa, and as a witness in Congressional hearings. His book, High Noon in Southern Africa: Making Peace in a Rough Neighborhood, was published by Norton in 1993. 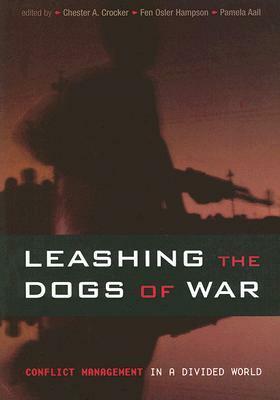 He is the co-author of Taming Intractable Conflicts: Mediation in the Hardest Cases (2004) and co-editor with Fen O. Hampson and Pamela Aall of: Rewiring Regional Security in a Fragmented World (2011), Leashing the Dogs of War: Conflict Management in a Divided World (2007), Grasping the Nettle: Analyzing Cases of Intractable Conflict (2005), Turbulent Peace: The Challenges of Managing International Conflict (2001), Herding Cats: Multiparty Mediation in a Complex World (1999) and Managing Global Chaos: Sources of and Responses to International Conflict (1996).